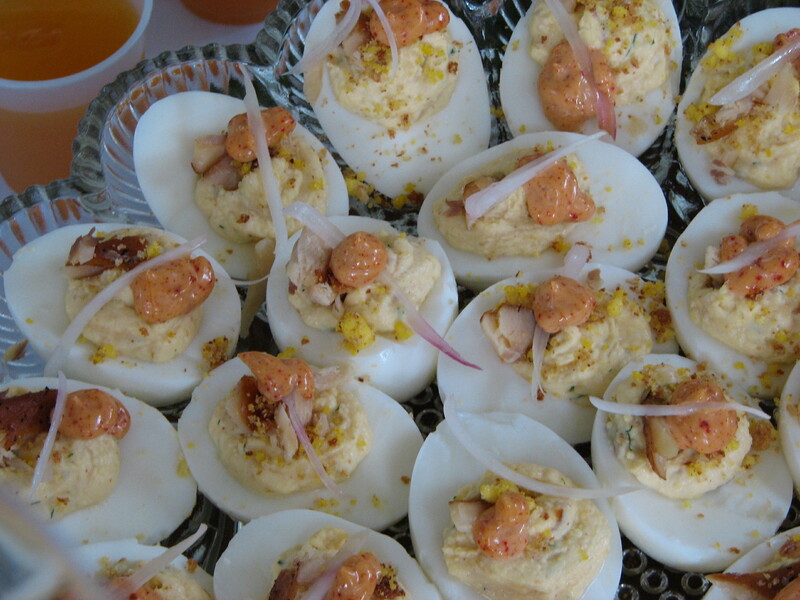 What started as a party thrown by two Durham guys who love deviled eggs and having a good time has turned into an annual fundraiser for Urban Ministries of Durham – and draws an invited crowd of 40-some deviled egg lovers. Emerson Beyer and Michael Bruno call it a Deviled Egg Pageant, where entries have names like Miss Southern Belle and winners receive sashes and deviled egg tiaras. Some of the 15 entries this year had a modernist architecture theme, appropriate since one of the judges was Durham architect Philip Freelon. The other judge was Colleen Minton, founder of TerraVita. has been a fundraiser, and it raised more than $2,000 for the organization. Presentation counts, as does flavor and the required accompanying beverage. Casting my vote was tough. There was the detailed display of Durham, featuring a diorama including a railroad fashioned from cigarettes, by a group of history buffs (and their spicy deviled eggs). Miss Mountain Aire was a smoked North Carolina trout deviled egg topped with pickled ramps, coupled with a yellow tomato bloody mary spiked with moonshine. Little Miss Can’t Be Wrong had whites rolled in cracker crumbs and cheese for a crunchy texture with the pimiento cheese-stuffed filling. Even after writing an entire cookbook on deviled eggs, I saw plenty of things I’d never thought to do with a deviled egg. 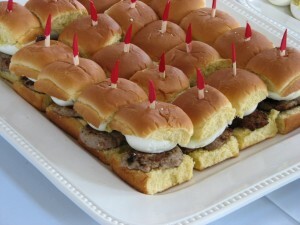 Like the deviled egg sliders – interesting idea, but it didn’t say “deviled eggs” to me (and it was messy). Audience Choice went to Miss Vierendeel, a beautiful curry-and-chutney deviled egg created by people from MdM Historical Consultants and Yellowbird Baking. The entry was named after a Dutch engineer, which proved that geekiness can be delicious.